Plantronics Voyager Legend UC means hands-free calling on iOS or Mac. There are a ton of Bluetooth headsets on the market today, and because I prefer talking hands-free, I’ve tried a lot of them. But as a Bluetooth enthusiast (yes, we exist), I’ve been continually frustrated. That’s because all the headsets I’ve tried thus far have missed the mark, especially when paired with an iPhone, delivering callers’ voices as muddy and hard to decipher, or making me sound like I live under the sea (I don’t). 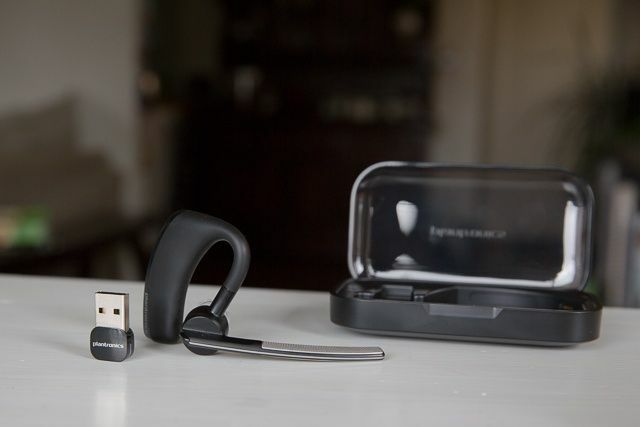 So when I got my hands on the Plantronics Voyager Legend UC, with its promises of excellent audio, call routing touch technology, and the ability to work on both my Mac and iOS device, I was dubious. Not anymore. 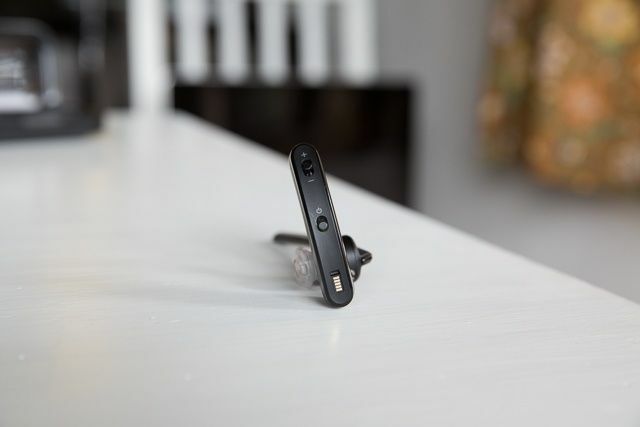 This little Legend hasn’t just proved my first impressions wrong, I’m now convinced it’s the best Bluetooth headset I’ve ever used. With two built-in DSP mics and three layers of built-in wind protection, Plantronics also says the Voyager Legend UC delivers the best audio quality ever put in a headset, but all manufacturers say that, and yet I’ve always ended up with mixed results. This little magnetic case keeps everything organized and charged. Another could-be-cool feature that red-alerted my gimmick alarm: sensitive capacitive touch technology. Plantronics says that layer of special sauce allows the Legend to detect when it’s on your head or in your pocket, thus allowing all sorts of cool routing functionality, like sending answered calls to your headset when you’re wearing it, but to your iPhone when you’re not. And finally, the “UC” designation of this model means the box includes a portable case with a clever trick: it holds the USB adapter and headset in place with magnets. That may not sound all that special, but it’s a genius design, and additionally, the case has a built-in battery that keeps the headset charged while within its clutches. Finally, a headset that delivers the excellent audio it promises, all the time, without exception. With virtually every headset I’ve used in the last four years, audio quality has, at least occasionally, either sounded garbled and subpar to my caller, or their audio sounded muddled and blown out to me. The Voyager Legend’s exceptional sound quality had me hunting for a high fiver, but better than that, and what still surprises me when I use it, is that it always sounded that great to all my callers. 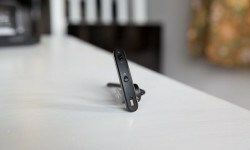 This simple feat is one no other headset has pulled off. Legend made my callers sound good, too. Too many headsets fail at this, delivering staticky, stinky, sounds-like-a-blow-out-speaker audio that has me constantly straining to understand what my caller is saying. Voyager’s speaker might be small, but its sound is sharp and balanced. Even the power and volume buttons are perfectly placed. Oh, and that sensitive capacitive touch technology? Not a gimmick! In real everyday use, it allows the headset to know when it’s on your head, thus routing incoming calls to your ear instead of the iPhone. Or, if you start a call on the iPhone, automagically rerouting audio back to headset when you put it on. Legend sitting on the table somewhere? Answered calls are delivered to the iPhone instead. This feature means no more talking into a device that may not be listening—all headsets should work this way. The touch tech. 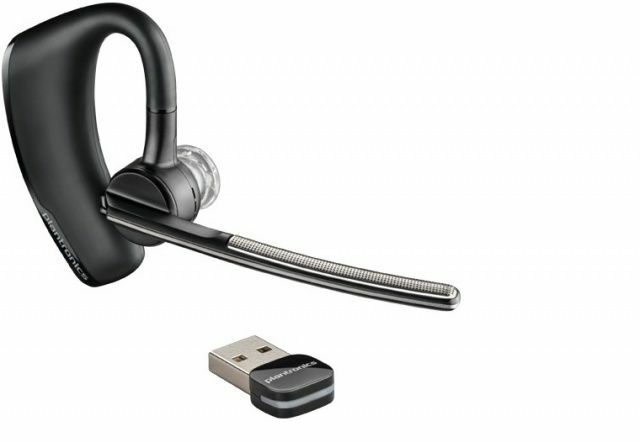 also fixes a huge problem other Plantronics headset have suffered: accidental calls. By knowing the headset isn’t on your knoggin, the Legend locks the call button so your thigh presses become totally inert. And speaking of buttons, the Voyager Legend’s are all right where they should be. The call button is easy to access and effortless to press, and the the mute button? Yes even the that oft-neglected button is so well placed, you’ll actually find yourself using it. 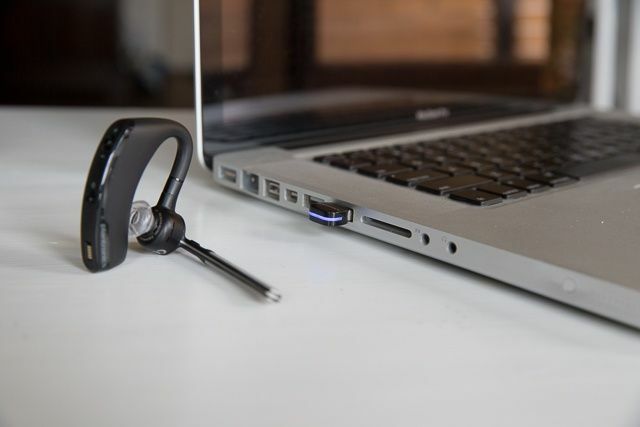 The included USB Bluetooth adapter makes Mac pairing a reality. So what about Mac integration? Well, I can hardly believe I’m typing this, but dog-gonnit, it works great. 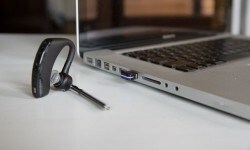 Usually headsets rely on your Mac’s built-in Bluetooth for this kind of connection, but by bypassing it, Plantronics has actually made the dream of a Mac compatible BT headset a reality. In my Skype tests, callers reported excellent audio, just as if I was calling them on the phone. This is honestly surprised me, because it’s a feature no other headset I’ve ever tried has pulled off. Slow clap Plantronics. 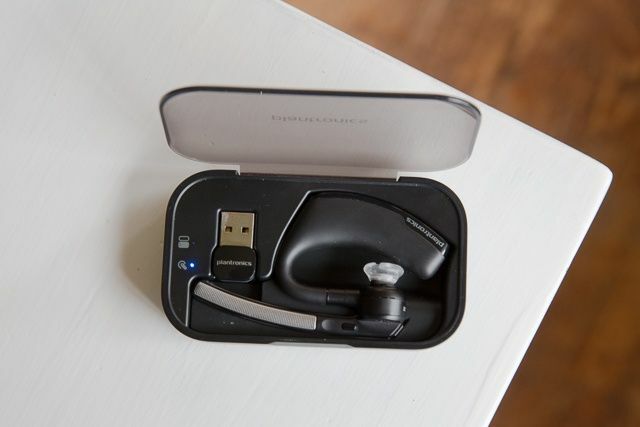 With two built-in DSP mics and three layers of built-in wind protection, Plantronics also says the Voyager Legend UC delivers the best audio quality ever put in a headset. Legend also earned a perfect score at maintaining its connecting while receiving navigation instructions from Apple Maps. Other headsets I’ve tried constantly cut out or cut off the beginning or end of instructions. The Legend never cut out, not once, and it never cut off speech. So is there anything I didn’t fancy about this Freddie Mercury-level headset? Well, you know those guys who are so good with the ladies? Yeah, that’s not going to be you, at least with the giant Voyager Legend affixed to your head. This this headset is in now way discreet, but with its giganto size comes 4-5 hours of talk time. The other thing: I could not for the life of me get the earpiece to stay in my earholes. You holes might fare better, but I’ve never liked the round earbuds for this exact reason, and I don’t know why Plantronics doesn’t include some teardrop-shaped tips in the box. Those little guys work great, and for a headset that’s basically the Cadillac of their line, I would have liked to see some included. The Good: Stellar sound. Intelligent routing tech. Works expertly with your Mac. The Bad: Kind of big. Kind of expensive. Earpiece might not stay in your ear. 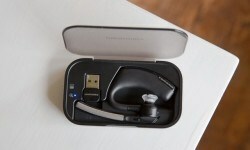 The Verdict The Voyager Legend UC is my favorite Bluetooth headset on the market today.